Sergio Wilms, a 19-year-old Latino, was shot and killed Jan. 18 outside a condominium complex in the 18200 block of Van Ness Ave. in Torrance, according to authorities. At the time of his shooting, Wilms was allegedly attacking a teenage boy packing a car for a Boy Scout camping trip. Carmen Reyes, a 58-year-old Asian man, was arrested the same day and then released four days later pending further investigation. A police spokesman told KTLA that the boy's mother had screamed for help and Reyes, who was renting a room from her, allegedly ran outside with a weapon and shot and killed Wilms. "Bottom line is somebody was killed and we need to know why this happened, or how this happened," Sgt. Robert Watt said. The Daily Breeze reported that people who knew Wilms were stunned by reports that he had been violent. 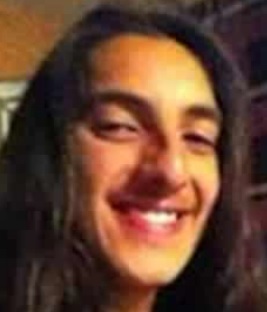 A former teacher of Wilms at Shery High School, a continuation school in Torrance, described him as a "peaceful kid" who liked to skateboard and go without a shirt or shoes. — Ben Garcia Dec. 30, 2016 at 7:29 a.m.
Whats more sad is people like you who dont know anything about him saying things like you KNOW what happened when you DONT KNOW ANYTHING. If you didnt know him personally like his actual friends did you wouldn't know if he had some kind of mental illness or substance abuse problems. Coming from someone who had to see his toxicology reports he WAS NOT UNDER THE INFLUENCE OF ANY DRUGS like the P.O.S who MURDERED HIM IN COLD BLOOD CLAIMED. whoever that lying pos Is saying that he attacked him is full of it and is just trying to keep his MURDERER out of jail. Bottom line those of you who know nothing about him have no room to talk and need to stay as far away from this as possible because its bad enough for all of us who love him and lost him to some stupid trigger happy P.O.S. we dont need ignorant lying people talking about someone they never knew anything about. And i feel sorry for those of you who never had the PLEASURE of knowing him because he was a wonderful person despite all the complete lies and false accusations made by you ignorant people. So do yourself a favor and stop talking when you dont know anything. — Cakes Aug. 23, 2016 at 10:22 p.m. I have no doubt his friends are sad about this incident, but Mr. Wilms bears full responsibility for his own death. Sorry. He wasn't murdered in cold blood, he was put down committing an assault. Somehow, I find it hard to believe Mr. Reyes was out hunting for shirtless hippies and found Mr. Wilms. Maybe he had some undiagnosed mental issue or substance abuse that caused him to react the way he did. Its painful and honestly shameful to see friends make excuses for criminal behavior, then blame the victim. A mistake was made and paid for. Sadness all around. — Ronny Jan. 29, 2016 at 3:27 p.m. It's already been two years, and although there are two sides to every story sergio didn't ATTACK anyone. The sad thing is the only side all the people who know absolutely nothing about him besides him being "shirtless" (which has nothing to do with his character he was just a hippie and liked being that way) will hear or believe is the side of the murderer. Regardless of if there was a VERBAL altercation or not the answer WAS NOT to murder an innocent man in cold blood. Those of us who actually knew sergio know that this is wrong and that the sorry excuse for a "man" who shot him should pay with his life for what he did, or at the very least be in jail but none of the cops care about sergio just because everyone who didn't know him judged him based on stuff that doesn't make him a bad person at all, you just don't know him. — Cakes Jan. 21, 2016 at 10:16 a.m.
Sergio we all miss you and love you dearly, the years I spent with you as not only my friend but boyfriend run through my mind every single day. I love you so much. No one will ever forget you, and I will help in any way I can to putting your killer behind bars, if it is the last thing I do. You gave my life so much meaning when I just wanted my life to end. — A. "cakes" July 25, 2014 at 7:55 p.m. I doubt he was shot for fun, it's possible the victim snapped and paid with his life. — Ghost July 21, 2014 at 9:35 p.m.
Over 18 is considered an adult..."Serg" was no "child" and was attacking, in fact, a real child, hence the screams from the mother. Denial is a cruel thing. If someone is remembered as being shirtless, then people need to pay attention or start asking questions. — Ralphie Wiggum June 7, 2014 at 10:52 p.m.
Serg! Well it's been 2 months to the day. And I still don't go a day without thinking about you. I dont understand how this monster got away with what he did to you. He will burn in the pits of hell for cold blooded murdering you. Well aidens here serg. Give it a few more weeks and we'll take him to see his uncle serg! We miss you buddy! You will forever be missed.! — Samantha and Aiden March 18, 2014 at 12:35 p.m.
a son to me & WE ALL love & miss you always & forever. — Bre Feb. 28, 2014 at 11:32 p.m.